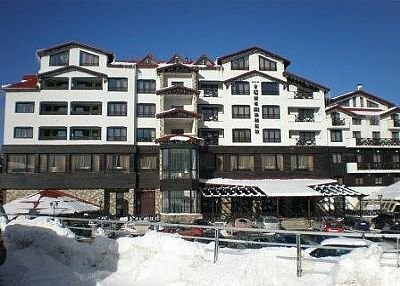 Situated in the centre of Pamporovo – the sunniest ski resort in Bulgaria. Snezhanka Hotel has recently undergone a complete refurbish and has now added 75 private apartments enclosing a landscaped garden, each with beautiful mountain views.All the facilities of this established hotel have been totally upgraded to provide a truly exclusive and unique place to holiday. Located at the foot of Snezhanka mountain, the apartments at Snezhanka Hotel have been recently built (DEC 2007), Our apartment has a fantastic view across a mountain valley, lush green in the summer and magically carpeted in snow in winter. Facilities include an indoor swimming pool and spa facilities,a Traditional Bulgarian restaurant, and a large buffet restaurant.Soon to be completed an indoor bowling alley. Inside, the apartment has been furnished to a high standard to help make your stay a comfortable one. The lounge has two sofas, both fold out to make double beds, as you can see from the photographs and makes for a very comfortable afternoon siesta! Satellite TV has been installed should you want a quiet evening in. Heating has been fitted so you can be sure that during the very coldest weather you can keep warm when you step inside. Having been on a few self-catering holidays ourselves, we’ve made sure that the right utensils are in place in the kitchen. Food and groceries can be purchased from well stocked shops in the mall across the road. Of course if self-catering is not your thing, there are plenty of restaurants in Pamporovo should you want to venture away from the hotel. Pamporovo provides excellent ski runs for all levels of difficulty, most starting from the Snejanka peak above the resort. Off the slopes there are numerous places for entertainment and interesting tourist attractions; the Rhodope Mountain region is interesting for its folk traditions and culture. PAMPOROVO SKI FACILITIES Pamporovo has excellent skiing and snowboarding facilities - 27 km of high-class ski runs and 39km of off-pistes cross-country tracks. Eighteen lifts (including a new 4-seater) have the capacity to serve 9000 skiers every hour. The ski pistes offer different level of difficulty - from super advanced (The wall) to beginners (the Tourist Track - 4km long). In Pamporovo you can find ski and snowboard schools with over a hundred qualified English speaking teachers/instructors. Daily lift pass is less than 20 pounds and at a half price for the kids. Ski rental equipment is also available at several locations. Email us for special ski packages. and discounts. PAMPOROVO ATTRACTIONS The nearest attractions to Pamporovo are Chepelare ski resort 10km Northeast, the architectural preserve of Shiroka Luka 15km West and the Wonder Bridges a natural phenomena 35 km North. Do not miss the panoramic cafe of the TV tower on Mount Snezhanka, and its observation gallery giving a splendid view toward the mountains. The Ski season in Pamprovo comes hand in hand with a full programme of events and activities, ranging from bum-boarding to a raucous ski-instructor’s show. Bowling is offered at hotels, ice-skating, skidoos and tobogganing are popular pastimes, and excursions to nearby places of interest and Sofia are on offer. The area has many good starting points for hiking, mountain biking or horseback riding around the region. Trails that cross the main ridges in southern Bulgaria, Mt. Chernatitsa, Perelink, and Prespa can be accessed from here. PAMPOROVO APRE SKI Plenty of pubs, restaurants and night clubs in Pamporovo offer a great value for money. A large beer of 500ml is less than £1, and a basic meal is approximately 2-3 £. Food varies from cheap local traditional cuisine (kebapche, kyufte, tarator, shopska salad) to Greek and Mediterranean specialties and Italian specialties. - Night Flight: in hotel Rojen. A new disco, the largest in Pamporovo. Very good party! The main shopping centre, containing mostly boutiques, souvenir shops and sports gear outlets, is attached to the Hotel Perelik across the road from Hotel Snezhanka.